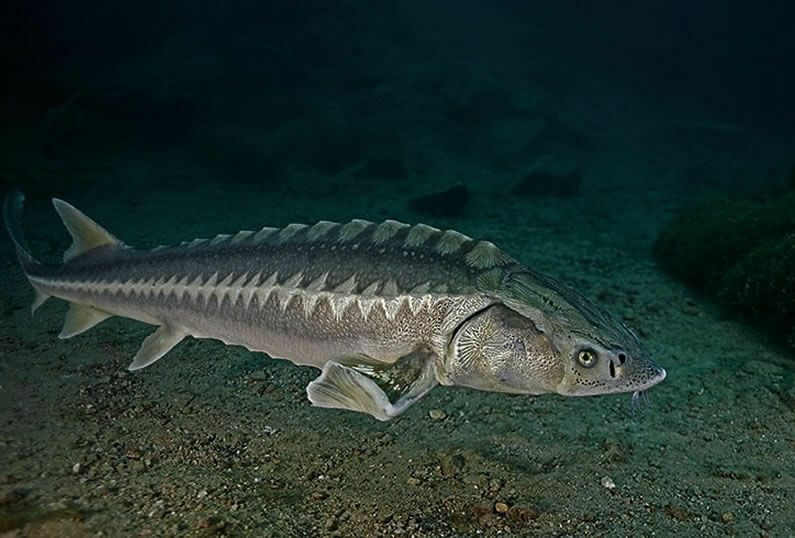 Russian sturgeon, also known as the diamond sturgeon or Danube sturgeon (Acipenser gueldenstaedtii), is one of 19 living species of the Acipenseridae family. They are endemic to the Pontic Caspian Basin and can be found in the waters of the Caspian, Black and Azov Seas. 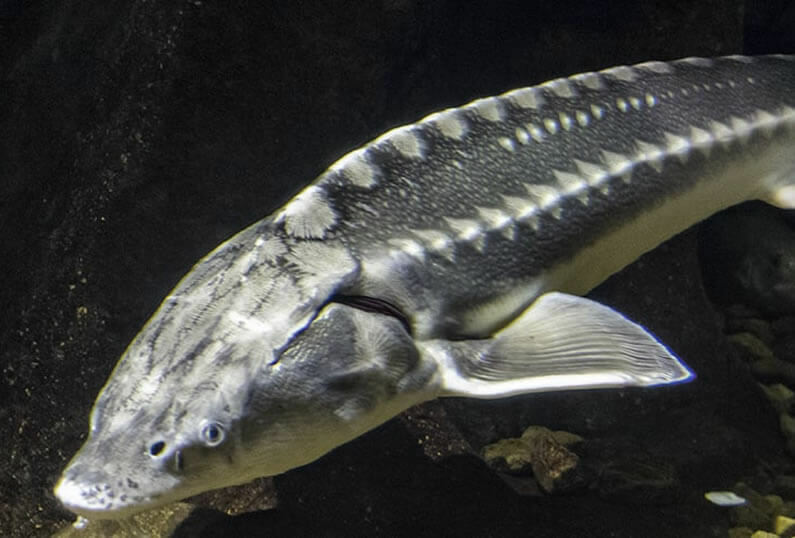 There are three stocks of Russian sturgeon: Rhine (Caucasian-Black Sea), Dnipro (Black Sea-Ukrainian), and Azov in the the Azov-Black Sea Basin. The species is considered critically endangered, according to the Convention on International Trade in Endangered Species of Wild Fauna and Flora. A very small population lives in Ukraine, which is listed in the Red Book. They typically live near the bottom of the sea. When it comes time to reproduce, the fish make their way to a river. 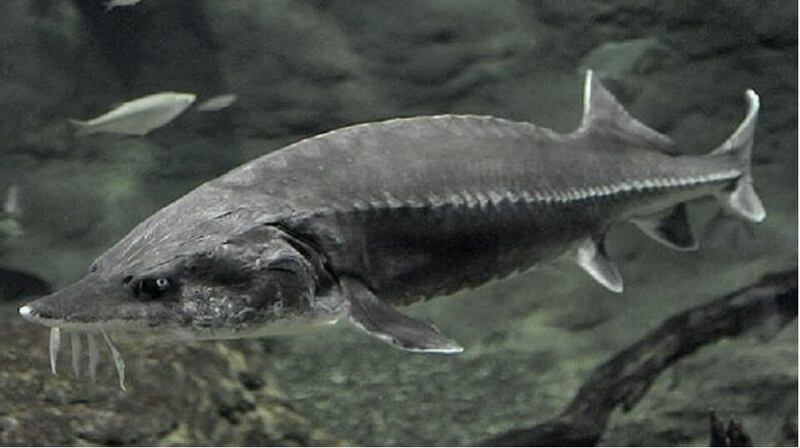 Caspian sea sturgeons, for example, spawn mostly in the Volga River, occasionally in the Ural River, and very seldom in the Terek, Sulak and Samur. On the Iranian coast, they reproduce in the mouth of the Sefid Rud River. The Azov population migrates to the Don River Delta, and occasionally to the Kuban River. Black Sea sturgeons spawn in the Dnipro and the Danube. The adult fish has an elongated, spindle-shaped body. The head is short and blunt. The grayish-black color of its backs contrasts with its white or yellowish abdomen. The sides are grayish-brown. Weight and size can vary greatly, depending on the population. On average, the fish reach a length of 110-130 cm and a weight of 12-16 kg. However, some fish can reach up to 100 kg in weight and 2.3 m in length. Males are smaller than females. Sexual maturity occurs at 8-10 years for males, while females mature 2-4 years later. Spawning occurs in areas of the river with sandy or rocky beds. Depending on age, females can produce 250,000-350,000 eggs. The river current scatters them after they are laid. After settling, they attach to the riverbed. This lasts about 3-5 days. The post-embryonic stage of development of the future baby fish lasts another 8-10 days. Juvenile fish can live in the river for more than a year, after which they make their way to the sea, where they remain until maturity. 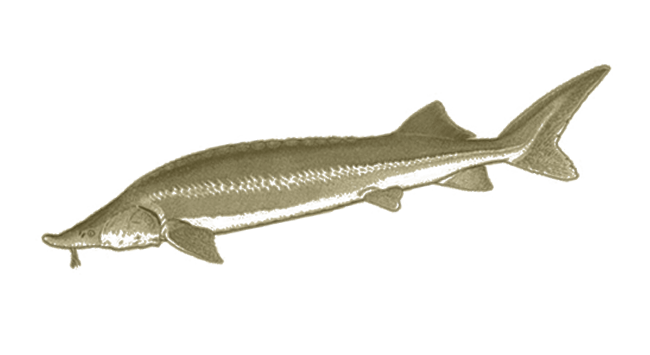 Russian sturgeon are feed on benthic (deep) organic matter, mainly bivalve mollusks, as well as crabs and all kinds of small fish. 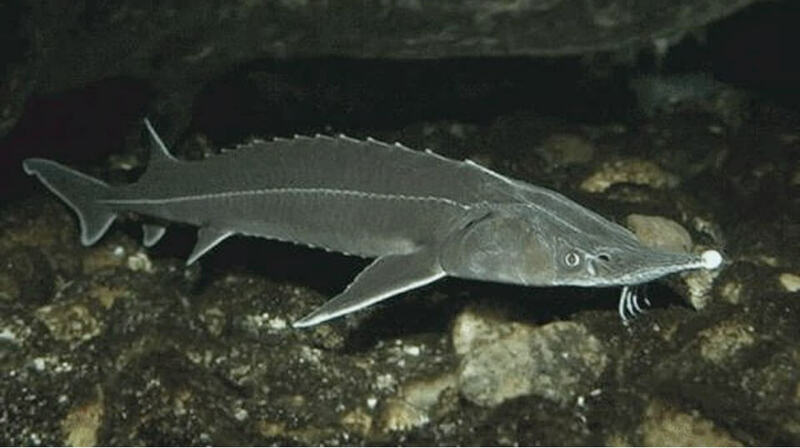 Bester is a hybrid of two species of fish from the sturgeon family. It is derived by crossbreeding beluga (huso huso) with sterlet (Acipenser ruthenus). Bester was first produced in the former Soviet Union at the Teplovsky fish farm in the Saratov region of Russia by Professors N. Nikolukin and N. Timofeeva in 1952. The aim of crossbreeding these fish was to create an a hybrid with increased fertility, combining the rapid growth of the beluga with the early maturity of sterlet. These days, there are two related of bester species: beluga bester and sterlet bester. Bester’s appearance blends the external features of both parent species. The color varies, from the typical colors of sterlet to that of typical beluga — light gray to black, bright brown to grayish-brown, and saturated brown. Typically, the dark black contrasts with a bright head. The shape of the mouth is an intermediate between a half-moon, typical of beluga, and transversal, typical of sterlet. Two pairs of slightly flattened mustaches are inherited from beluga, sometimes with a slight wave or jagged end. Bester typically grow to about 30 kg and 180 cm in length. The beluga bester is almost twice as heavy and half a meter longer. The bester has a high tolerance for salinity. Under conditions of high oxygen saturation, it can live at a temperature of up to 34 degrees Celsius. The optimal temperature for growth is 20-24 degrees Celsius. Breeding is a unique process. The product (black caviar and milt) is usually obtained in the winter-spring period, from February to June (depending on the temperature of water), using the live extraction method, also known as "milking." Females produce about 100,000 to 300,000 eggs, while beluga bester can produce up to 500,000. Males reach maturity at 4-5 years, while females mature at 5-9 years. Beluga bester matures a little later, at 8-9 years for males and 9-14 years for females. Juvenile bester begins to eat intensively in the first 3-5 days, consuming zooplankton, small insects, and granulated feeds. The adult diet consists of small fish and granulated feeds. First-generation hybrids are kept for two years in cages and pools and reach a weight of 1 kg or more. Bester, originally bred for industrial use, is now an important issue of aquaculture. It is forbidden to release bester into waters where indigenous populations of sturgeon live, due to the danger they pose to populations of pure species, especially beluga. Industrial breeding and growing current takes place in Germany, Poland, Italy, Russia, South Korea, Japan, China, the United States, and, of course, Ukraine. We aim to breed and promote sturgeon populations. We firmly reject the "slaughter" method of producing caviar. 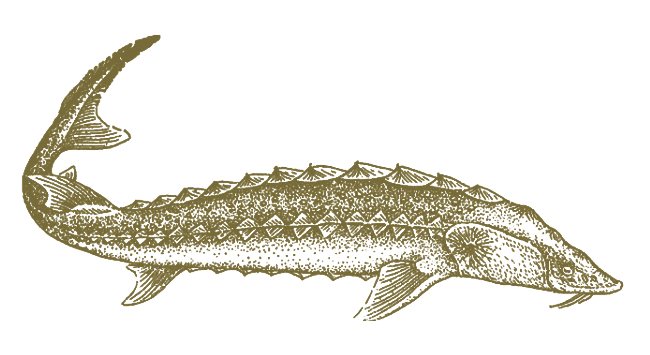 Caviar can be extracted without any damage to a sturgeon’s health.